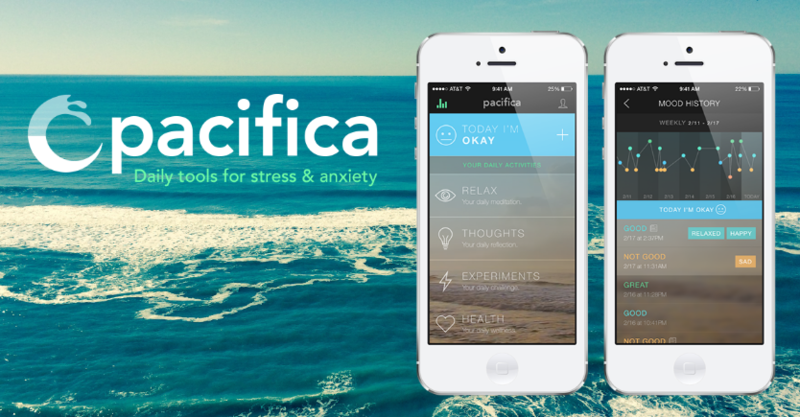 Pacifica is a mobile- and web-based app intended to assist users in relieving stress, anxiety, and depression. The tools embedded in the program exercise strategies drawn from different evidence-based practices, such as cognitive behavioral therapy (CBT), mindfulness meditation, relaxation, and mood/health tracking. Pacifica tunnels users according to user-generated reports and preferences. Upon entering the program, users are invited to update their current state (mood, health, goals, etc. ), after which they receive specific recommendations for just-in-time activities that include guided self-help paths (each lasting several days), relaxation techniques, and group chats. Main features include mood and health (sleep and exercise) trackers based on self-reports; guided paths that provide daily CBT-based audio lessons; and active chat groups focused on various topics (e.g., PTSD, anxiety and depression, relationship). Basic features in the app are free, but some of the growth paths, relaxation activities, and tools are available at an additional fee. Most of the activities do not require more than a few minutes of daily utilization. Variety of active chat groups/ Basic features (including chat groups) are free/ Mood tracker can be helpful as a supplement to treatment. As a self-help program, tools are presented in a sporadic manner, with no A-to-Z guidance/ Web-based app is lacking in usability. Pacifica’s design is suitable for teenagers and young adults who are dealing with mild to moderate distress. The program’s strength lies in the combination of active chat groups and tools to assist with the coping process. Specifically, the various topics for group chats along with a youth-oriented community create a welcoming experience. As a self-help program, tools are presented in a sporadic manner, with no A-to-Z guidance. As a result, the program can be somewhat confusing and more suitable as a supplement to ongoing treatment. In our evaluation, the web-based program was lacking in some usability aspects compared to the mobile app. Pacifica could be helpful as a supplement to treatment for teenagers struggling with mild to moderate distress. The clinician can take part in analyzing the daily mood tracker during therapy sessions. In addition, the app can provide “in-between” support through the use of chat groups related to the patient’s specific mental health difficulty.